Homemade Pumpkin Soup never tasted so good. A lighter Pumpkin flavour, thanks to a few added ingredients. Creamy and delicious. Don’t forget to add some Parmesan Croutons. 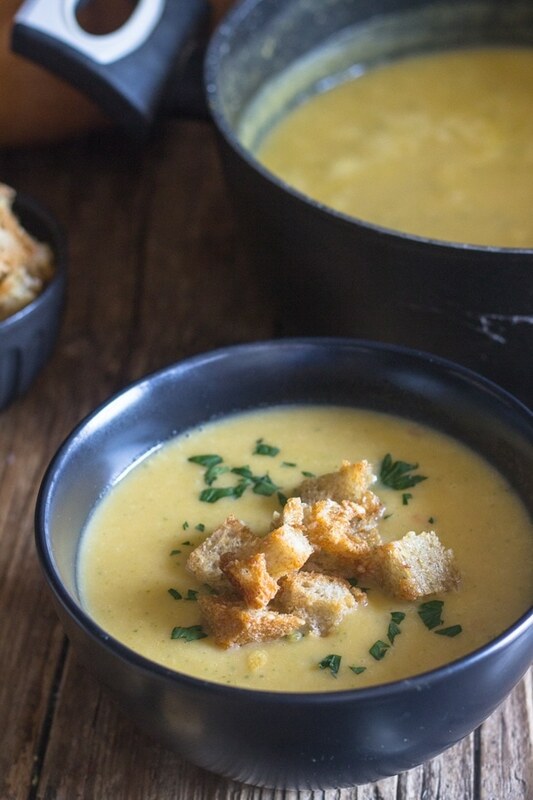 I think one of the best things about Fall, (although I have to admit Fall is my favourite season, so I love everything about it), has to be soup! Squash is everywhere in the stores now. So I have been experimenting a bit with it this year. I even made a very tasty Pumpkin Focaccia with Black Olives. My daughter and my husband aren’t crazy about a really strong Pumpkin taste so I made it creamy and on the lighter side with the addition of potatoes and leek. In a large pot add olive oil and the chopped leek, cook for about 2 minutes. Then add the cubed pumpkin, potatoes, parsley, salt, pepper and broth. Re heat with a little cream and serve with Homemade Parmesan Croutons. It’s so easy to make Parmesan Croutons, just take some day old crusty Italian bread. Cut a few slices, I remove the crust but you probably don’t have to. Cut the slices into cubes, toss with a little olive oil and a couple of tablespoons of parmesan cheese. Place the cubes on a cookie sheet and bake for 10-15 minutes, halfway through mix them up so they brown on all sides. One of the best things about a thick hearty soup such as this Pumpkin Soup is that you really don’t need anything else, except maybe a good crusty bread and a simple salad. Since I added a few extra ingredients to this Soup Recipe to lessen the taste of the pumpkin I think pretty well any available squash would work in this soup. Such as butternut, acorn, Kabocha and pumpkin (such as Small Sugar, New England Pie, Baby Pam, and Pik-A-Pie). 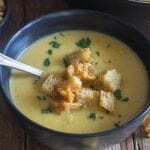 So if you are looking for a tasty Homemade Pumpkin Soup to make this Fall and Winter Season, I hope you give this a try. Buon Appetito! 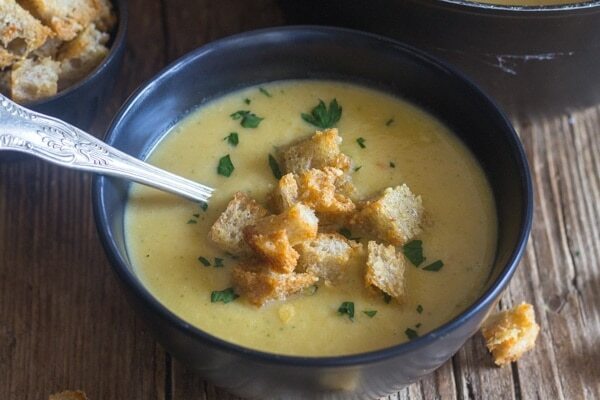 Homemade Pumpkin Soup never tasted so good. A lighter Pumpkin flavour, thanks to a few added ingredients. Creamy and delicious. Don't forget to add some Parmesan Croutons. In a large pot add the olive oil and sliced leek, cook for approximately 2 minutes. 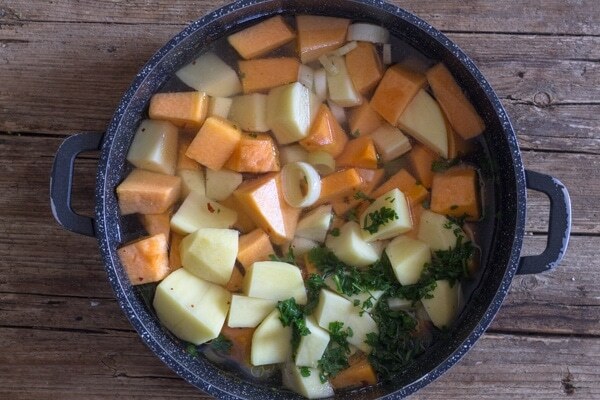 Then add the cubed pumpkin, potatoes, parsley, salt, pepper and vegetable broth. Bring to a boil on medium high heat, then lower heat and continue to cook for approximately 25-30 minutes or until vegetables are tender. Pour into a blender and blend until smooth, pour soup back into pot and add the cream, stir to combine and heat until hot. 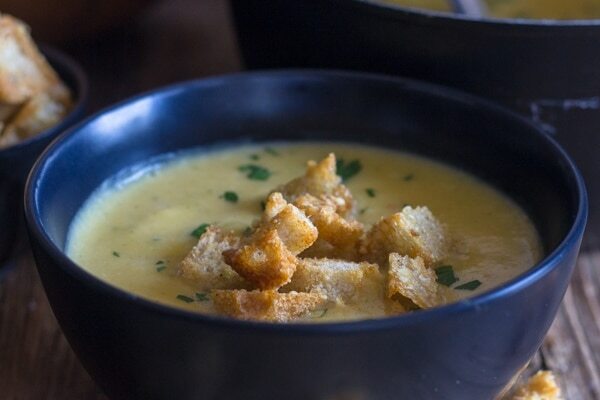 Serve with homemade parmesan croutons. Enjoy! In a medium bowl toss together the cubed bread, olive oil and grated parmesan cheese. Place on a cookie sheet and bake for approximately 10-15 minutes, halfway through baking flip the cubes and continue baking. Any tips for cutting a raw pumpkin? I’m imagining that like butternut squash it’s probably tough. Thanks!! Hi Hannah I just place it on a wood lard and with a sharp carving knife I cut it into pieces, then with a smaller knife I carefully remove the skin. Hope that helps.